After several stunning releases from RED trio on esteemed labels such as Clean Feed, NoBusiness & Bocian Records, Astral Spirits is incredibly honored to present the first release from RED trio on a US based label. Not only that but this is also only their 3rd release solely as a trio sans guests. “Live in Munich” documents an incredible show from Munich recorded less than a year ago in April 2014. RED trio continues their deconstructive assault on the piano trio concept to give it an entirely new meaning and language. Rodrigo Pinheiro (piano), Hernani Faustino (double bass) & Gabriel Ferrandini (drums) have asserted themselves as some of the most in demand improvisers in Lisbon and all of Europe…working with Nate Wooley, John Butcher, Matthias Stahl, Rob Mazurek, Rodrigo Amado, Raymond Strid, Chris Corsano, John Zorn just to name a few! “Live in Munich” features two side long tracks that once again document the mesmerizing interplay between these three…from breathtakingly melodic to intensely quiet to violent outbursts of energy. The piano never takes center stage, the rhythm section isn’t really a rhythm section, each player creates sounds weave together incredible emotional depth and sonic range from three simple acoustic instruments. 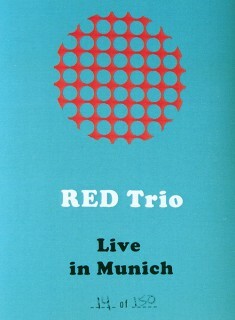 “Live in Munich” is yet another daring and essential release from RED trio, one of the most important working groups in free jazz at the moment. “Live in Munich” is out March 31, 2015 in an edition of 150 tapes w/digital download.